Edward Snowden Wins ‘Debate’ With NSA Lawyer | What's The Big Data? Indeed, the specific details about this surveillance program or that particular law are far less important than the answer to a single question: In defending your country, do you do the right thing or do you do things right? Do you do what’s morally right or do you just follow the rules (or make sure it looks like you follow the rules)? I think Snowden won the “debate” hands-down because I much prefer his view of the good people of the NSA. Snowden sees them as thinking humans, aware of the values of the country they are trying to defend, and capable of making difficult decisions and weighing all the ramifications of their actions. They went wrong because they got carried away by their mission. DeLong, in contrast, views NSA employees (himself included) as no different from the machines they work with, capable only of following unquestionably rules that are handed down to them by others, rules that can be (and should be) codified into machine language. They haven’t done anything wrong, because they have never broken the law. 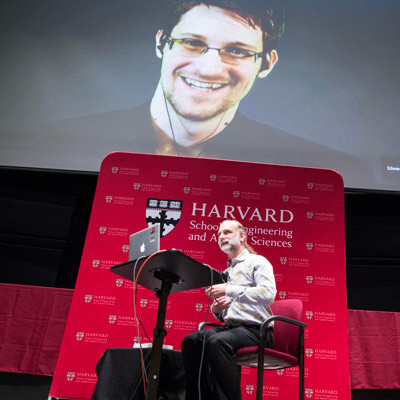 As you can see in the video below, most of the Snowden-Schneier discussion revolved around the familiar themes we’ve seen since the 2013 revelations: The solution to governments intruding into our lives is technology or the encryption of all communications; mass surveillance has exploded because it’s cheap and easy but it has never stopped a terrorist attack; the technical advantage the NSA used to have over the bad guys has been all but eliminated; the NSA has shifted its focus and a much larger proportion its effort is in offence, not defense. This is not to say that the NSA should have had all of the authorities it was given. The Review Group found that many of the programs undertaken by the NSA were highly problematic and much in need of reform. But the responsibility for directing the NSA to carry out those programs rests not with the NSA, but with the Executive Branch, the Congress, and the Foreign Intelligence Surveillance Court, which authorized those programs — sometimes without sufficient attention to the dangers they posed to privacy and civil liberties. The NSA did its job — it implemented the authorities it was given. Of course, “I was only following orders” is not always an excuse. But in no instance was the NSA implementing a program that was so clearly illegal or unconstitutional that it would have been justified in refusing to perform the functions assigned to it by Congress, the President, and the Judiciary. Although the Review Group found that many of those programs need serious re-examination and reform, none of them was so clearly unlawful that it would have been appropriate for the NSA to refuse to fulfill its responsibilities. So following orders “is not an excuse” and the NSA followed orders that were “highly problematic” but the responsibility lies elsewhere because the NSA people are simple automatons? And if “many of those programs need serious re-examination and reform,” why does Professor Stone, instead of thanking Snowden for being the catalyst for this much needed re-examination, think that he “deserves punishment”? Similarly, DeLong said that in regards to Snowden, “we need to let the wheels of justice turn in his case.” And he talked about the President’s directive of January 2014 and updates on this presidential policy next month, all of course coming after Snowden’s revelations. “When the NSA says we are going to be more transparent in this place, you need to hold us more accountable,” DeLong exhorted the audience. Would he talk today about the need to move transparency “up a level” if not for Snowden? Did DeLong refer to the membership of the presidential Review Group mentioned above when he talked about “self-reinforcing circles”? Are “computations” really the solution to what are essentially moral dilemmas? We have here a serious and probably sincere person defending in such a way the actions of the NSA because Big Talk and Big Data have taken over. Big Talk is what Orwell called “Newspeak,” the language invented by the totalitarian state in 1984. Have you noticed that a certain “Duckspeak”—“just because we can do something, doesn’t mean we should do it”—has been repeated again and again by government officials since 2013? It’s not efficient, it’s not effective, it may even do more harm than good. But above of all, the ideology of big data turns us into machines, making decisions based on code, substituting rules and laws for ethics and values. The lure of big data and the temptation to collect it all is everywhere you turn. At the symposium, I overheard a Harvard Computer Science professor compliment an undergraduate student on her wise choice of concentration, bio-informatics, telling her that a large pharmaceutical company told him “they have so much data, there are probably 3 or 4 drugs hidden there.” This blind belief in the automated discovery powers of lots and lots of data is fine when all that is at stake is a corporation’s profits. It is, however, a critical endurance test for the government of the people, by the people, for the people. This entry was posted in NSA, Privacy, Security. Bookmark the permalink.